Hello good people! It’s been a while since I last posted but I’m back! Yesterday I realized Valentine’s Day is coming up so I figured I do a few lovey-dovey themed posts to honor the occasion. For this post, I was inspired by the classic gift-wrapping of Tiffany & Co., the famous jewelry and silverware corporation. I haven’t been able to find another nail polish that matches this color better than China Glaze For Audrey. I used that on my ring finger accent nail and painted a white bow and ribbons over it. 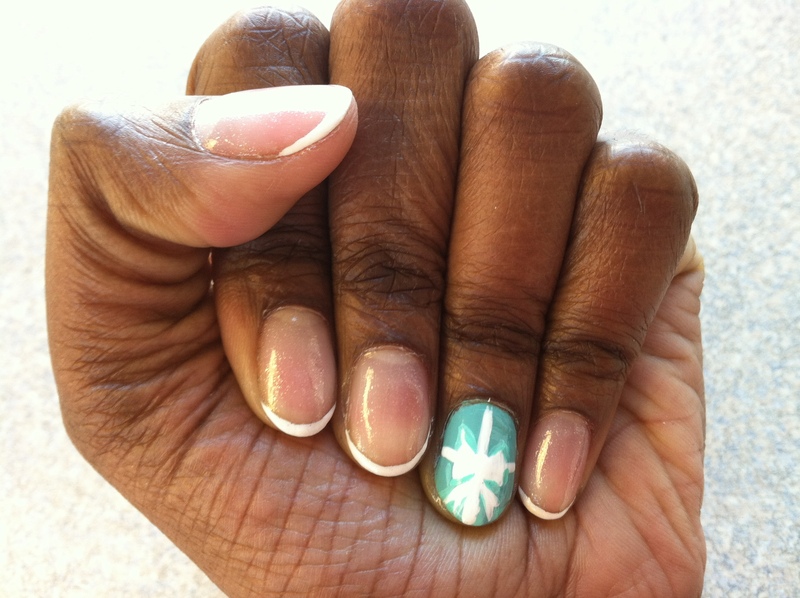 On my other nails, I created a simple French manicure using a Kiss nail art striper brush. I also used one thin coat of Orly Twilight for a bit of shimmer on the French manicured nails. Posted on February 6, 2012, in Inspired by... and tagged china glaze for audrey, Kiss Nail Art, Orly Twilight, Tiffany & Co., Tiffany & Co. nails, Valentine's Day nails. Bookmark the permalink. 8 Comments. You are beyond talented. You oughta have an A-List of famous women to do nail designs for ’em. Jus’ Sayin’.